Paul Robeson, Othello (The Theatre Guild, 1943). 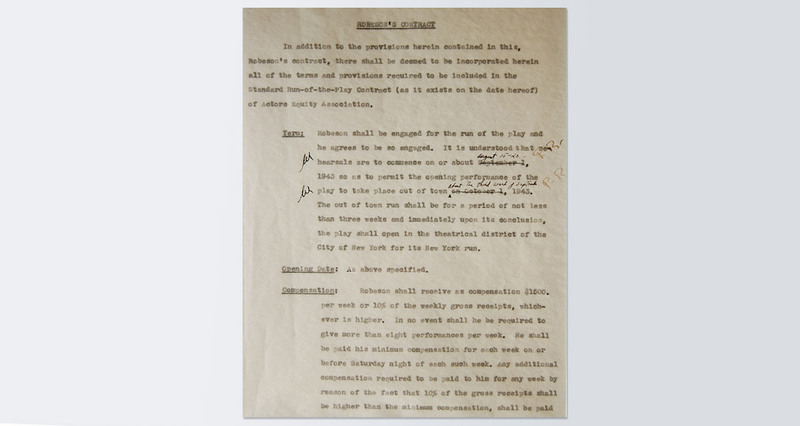 Typed document, entitled “Robeson’s Contract”: three-page contractual understanding to produce Shakespeare’s Othello; signed and annotated by both Robeson and Lawrence Langner, January 26, 1943. In the early 1940s, Robeson and Webster decided to test the waters together. A veteran cast was assembled (with the crucial roles of Desdemona and Iago assigned to Uta Hagen and Jose Ferrer; Webster herself played Emilia), and tryouts were scheduled in Cambridge and Princeton (Robeson’s birthplace). During August 1942, the racially mixed company gave laudatory performances at the Brattle and McCarter Theatres. Producers expressed interest. 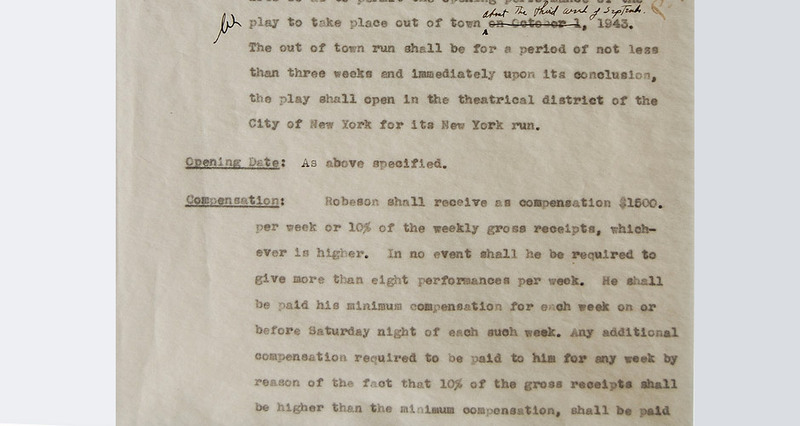 The Theatre Guild’s provident founder, Lawrence Langer, Robeson’s friend since the early 1920s, agreed to assume financial control of the show. Contracts were drawn up for Robeson, Webster (director), and Haggott (manager-technical advisor). Playwright Eugene O’Neill’s versatile colleague, Robert Edmund Jones, was recruited to design sets and costumes. Before Othello ended its Broadway run in the summer of 1944, the 46-year-old tragedian had harvested a plethora of awards, including that of the American Academy of Arts and Sciences. The record-breaking 296 performances were the supreme moment of Robeson’s artistic career and, in Webster’s words, a “landmark of American social consciousness.” Decades after Othello riveted Broadway, poet Robert Hayden paid homage to Robeson: “Call him deluded, say that he was dupe and by half-truths betrayed. I speak him fair in death, remembering the power of his compassionate art. All else fades.” A cornerstone piece of African Americana.